Musgrave initially found himself embracing the campaign themes of ending corporate welfare and stopping political interference in government contracts. But he said he became "very uncomfortable" when the party’s full platform was released publicly. "Frankly, when I signed on, I didn’t understand the fracking policy," Musgrave said. For someone who got into the election, so he could speak out on the possibility of a shale gas industry in the province, the daylight he sees between his personal opinions and the party he is running for, is a problem. Had he known the full policy, the small business owner from Saint-Paul said his decision to enter the race would have been very different. "I wouldn’t have run. I don’t want to let people down now, but I didn’t understand the platform," he said. "These people have good intentions, but it is not explicit enough, it is not clear enough." NDP Leader Dominic Cardy said on Thursday that he is not aware of any concerns about his party's platform from his candidate. "This is the first I’ve heard of this," Cardy said. "Our platform is a very sensible platform that deals with making sure that we say no to the shale gas industry, suspend the licences on the first day and then set up a Human Health and Environment Agency to make sure that any industrial developments in this province are in the interest of the people of this province." Musgrave is running in a riding that would likely be difficult for the NDP to win in most elections. He is running against Progressive Conservative Claude Williams, who has represented Kent South since 2001. The new Kent South riding also takes in parts of the former Kent riding, which was held by Liberal Leader Brian Gallant until the legislature was dissolved. 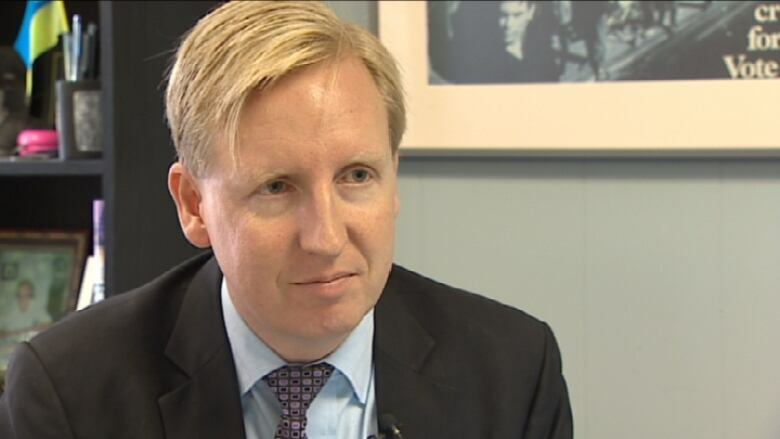 NDP Leader Dominic Cardy said it is "ludicrous" to think his party is pro-shale gas. (CBC)​Musgrave raises several specific concerns with the NDP’s platform. Cardy is proposing to create an independent Human Health and Environmental Protection Agency that will review all resource programs in the province. Musgrave said he raised his concerns that this agency could be taken over by political interests if the agency and the appointment of its members weren’t fully kept away from politicians. The NDP candidate said scientists and not politicians need to be selecting this panel. Cardy said on Thursday the province's chief scientist would be appointed by the government and then that person would be responsible for appointing the rest of the members of the agency. The NDP leader said it is "ludicrous" to think the NDP platform could be considered pro-shale gas. 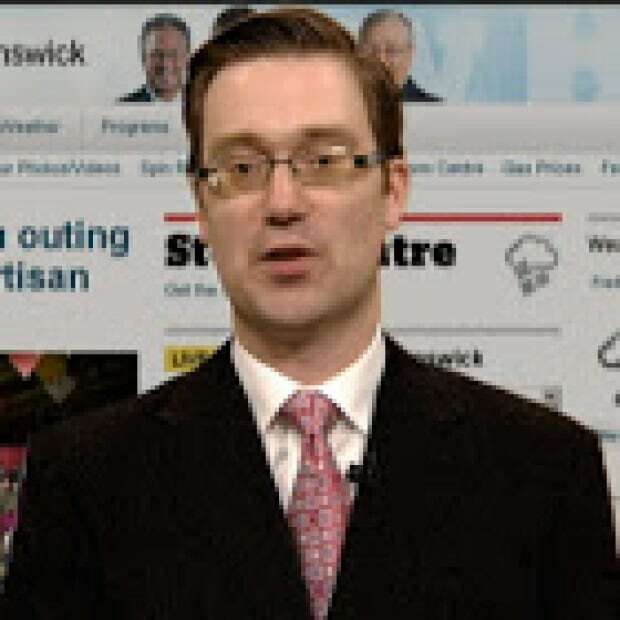 The Kent South candidate also said the NDP, along with the Progressive Conservatives and the Liberals, have not clearly stated what will be done for homeowners in areas that become home to future shale gas sites. There are five candidates running in Kent South, but only four candidates have signs around the riding. Musgrave said he has no budget for election signs. (Daniel McHardie/CBC)​Musgrave said no one should be forced to live near these shale gas wells and he said no parties are talking about whether possible compensation will be available to these people in the future. Musgrave, weighing his words very carefully, said he understands what he says may not be popular with some people in the party. But he said he owes it to those in his riding to raise these concerns. "An ethical candidate needs to speak out," Musgrave said. "Are my loyalties to the party, or are they to the people of New Brunswick? If it comes down to it, it is to the people of New Brunswick, my friends and my neighbours." The candidate said he did try to raise his concerns with people inside the NDP once he started to read the full platform. "I brought it to their attention, but frankly I don’t have a lot of influence in the party. But this is a question that has to be put to them," he said, regarding his concerns about the party’s shale gas policies. He added, "The leader is Dominic Cardy and he is aware of my concerns but I haven’t had any clarification from him on this issue." While the anti-fracking signs could be spotted without much trouble, finding Musgrave’s election signs was more of a challenge. The NDP candidate said he was not given a budget to purchase any campaign signs. So at intersections that have signs for the Progressive Conservatives, Liberals, Green Party and People’s Alliance, there is one party noticeably absent. But that is not the only issue hampering his ability to get his message out. Stephen Yardy, the executive director of the NDP, sent an email to all of the party’s candidates earlier in the campaign, telling them they were to avoid an invitation for free airtime on Rogers Television. "Candidates are to decline the invitation as we did in the 2010 general election. We will discuss this more tonight on the candidate conference call," Yardy's Sept. 3 email said. On Thursday, Cardy defended Yardy's decision to stop candidates from participating in the free television spots offered by Rogers. "We knew that the Liberals and the Conservatives would be setting up monitoring efforts, which all the parties do to monitor every single thing that candidates across the province say," Cardy said. "We wanted to avoid having 49 different messages responding to the same questions that the Liberals and Conservatives would try and use to distract from the real issues." Musgrave confirmed he saw an email, which was obtained by CBC News, but he would not comment on specifics in that party correspondence. While he admits he followed the orders, he said candidates should be given more freedom to speak out on local issues. "Can a party trust the candidates to speak publicly? Voters have a right to know their candidates," he said. On Thursday, representatives from both the Progressive Conservatives and Liberals said they did not restrict their candidates from participating in the free television advertisements. In a subsequent email, Paul Musgrave told CBC News that, "Before I signed on, the executive director told me that the NDP policy was to ban fracking. But that changed later, when the official platform was published in early September, after I had become an NDP candidate. Since the newly published official platform did not include a ban on fracking, I asked the leader on Sept. 5 how he would compensate any homeowners who would be forced to accept fracking sites in their neighbourhood. But I have not received any clarification from him on this issue." Musgrave also said, "I wouldn’t have run. I don’t want to let people down now, but the NDP's actual policy on fracking turned out to be very different from what they had originally told me."